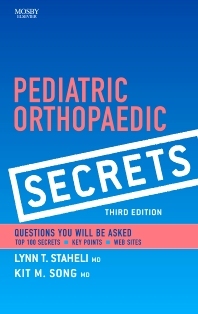 experts provide you with authoritative, up-to-date guidance on every aspect of orthopaedic disorders in children. From growth and development to integrating a child with a disability into society to physeal injuries to child abuse to youth sports and related injuries—this book presents all the key elements of orthopedics for clinical use, rounds, and board preparation.. Provides well-rounded coverage of orthopedic issues, including growth and development · integrating a child with a disability into society · physeal injuries · child abuse · youth sports and related injuries · and more. Expedites reference and review with a question-and-answer format, bulleted lists, mnemonics, and tips for the authors.